Pick your sauce! National Spaghetti Day is today, January 4, and it recognizes that long, thin cylindrical pasta of Italian and Sicilian origin. Usually made from semolina flour, this pasta has been a worldwide favorite for ages and loved by millions. Spaghetti was a staple in my home growing up. Mother made a simple meat sauce using only salt and pepper for seasoning, but we enjoyed every mouthful. She never served salad with it. The meal consisted of spaghetti and toasted, buttered bread as a pusher. And, yes it was quite enough. There are a variety of different pasta dishes that are based on spaghetti from spaghetti ala Carbonara or garlic and oil to spaghetti with tomato sauce, meat sauce, bolognese, Alfredo sauce, clam sauce or other sauces. Spaghetti dishes are traditionally served topped with grated hard cheeses such as Pecorino Romano, Parmesan and Grana Padano. In the 19th century, American restaurants offered Spaghetti Italienne, which was spaghetti noodles with a mild, tomato sauce enhanced with cloves, bay leaves, and garlic. It was decades later that oregano and basil were added. As to the origin of spaghetti, there is debate. In the Jerusalem Talmud, itrium, a boiled dough was common in Palestine for the 3rd to 5th centuries. An Arab dictionary refers to itriyyas as string-like semolina dried before cooking. Itriyya was manufactured and exported from Norman Sicily. Because dry pasta could be easily stored, ships took it to America and other explored countries. In March of 2009, the world record for the largest bowl of spaghetti was set and then reset in March of 2010 when a Garden Grove California Buca di Beppo restaurant successfully filled a swimming pool with more than 13,780 pounds of pasta. My grandmother Lulu found a new way to serve spaghetti and passed it on to her family. This easy casserole consisted of 6-7 cans of Campbell’s spaghetti, two pounds of cooked ground chuck and one medium onion, a drained can of mushrooms, all mixed together and topped with grated cheese. Season to individual tastes, the mixture is placed in a 8×13′ dish and baked at 350 degrees for thirty minutes. It became another favorite at our house, and I am the third generation to make it. This recipe has been enjoyed by the fourth generation of the Collins family. Now you must be wondering why I am writing about spaghetti. 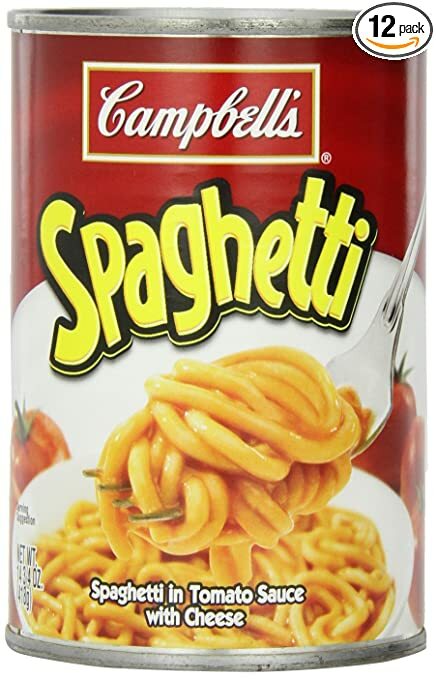 Before reading that this was National Spaghetti Day, I had placed on my kitchen counter seven cans of Campbell’s original spaghetti, an onion, and a large can of mushrooms. In the frig is the ground chuck and cheese. Who knew? Sung to the tune of “On Top of Old Smoky,” the fun children’s song, “On Top of Spaghetti” was written and originally sung by folk singer Tom Glazer.I remember singing this song, and perhaps you do, too. I remember singing this song, and perhaps you do, too. There’s nothing like a little nonsense nostalgia to start off a new year! Happy New Year! Posted in Uncategorized and tagged Campbells Spaghetti, Garden Grove California Buca di Beppo restaurant, Lulu, National Spaghetti Day. Bookmark the permalink.